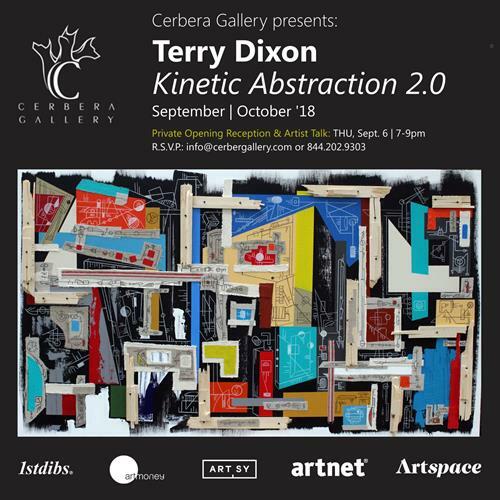 Cerbera Gallery presents: Terry Dixon "Kinetic Abstraction 2.0"
Name: Cerbera Gallery presents: Terry Dixon "Kinetic Abstraction 2.0"
Experience Cerbera Gallery's new exhibition Terry Dixon: "Kinetic Abstraction 2.0" accompanied by selected ceramic works. Terry Dixon: "Kinetic Abstraction 2.0"
In this body of work, he pushes things to the next level by continuing to work with his water color markers, adding wood, oil pencil, linen, canvas and wire to the surface of his work. As you combine all these various mediums, the viewer's eye is pulled in various directions across the surface of his creations. Terry Dixon's background of artistic methods span way beyond the traditional studio art practices in his work. His fascination with motion and electronics is present in his work with animation. In the finishing process of each mixed media art piece, he scans in the surface of his creations and digitally manipulates the motion of various mediums on the surface of his creations. The artist's work has fascinated viewers through the years, because it engages the audience's eye. One thing is seen through different perspectives and a new pattern or color is seen in his work and this continues to keep his audience engaged. Over the years, Terry Dixon enhanced his techniques on canvas by combining my photographic images with acrylic paint, oil pastels, and ink. During Terry Dixon's years of experimenting with digital technology, he has found and interesting marriage between traditional studio techniques and digital media. Terry Dixon's work has taken on a life of its own through the abstract kinetic lines that move to a mental rhythm as they flow from his hand. Every line, paint stroke, is a free flowing idea that is deeply rooted in sight and sound. Terry Dixon's art is also influenced by, political issues, society, various free flowing ideas, and the backbone element of his art is fueled from the "Free Jazz Style" prevalent in the 1950s to the 1970s. As he listens to deep bass cords, drum beats, and harsh trumpet notes, he explores his intuitive approach and expresses his artistic style through rhythm of sound. As the artist creates his art, some parts become mistakes that turn into masterpieces and it is all in conjunction and influenced by jazz music. For all press inquires and group visits, contact Philipp Eirich at info@cerberagallery.com. We encourage local museums and art groups interested in private tours to book dates in advance since this exhibition will only be on view for a seven weeks.As usual on #First Friday we'll have chilled background tunes coming from our very own DJ Deep House Cat and will be serving libations and snacks. Our doors will open at 3pm, so make sure you'll stop by!